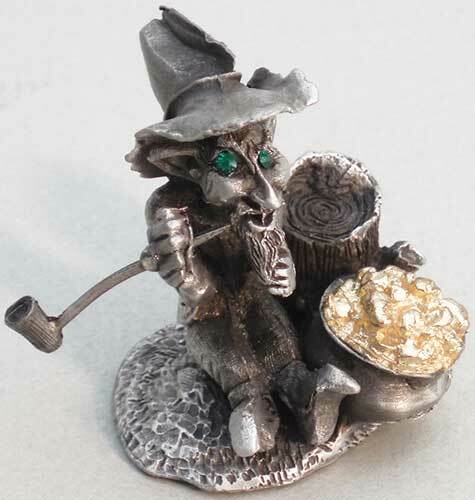 Miniature leprechaun is a pewter figurine that features green glass eyes, a pipe and a pot of gold. 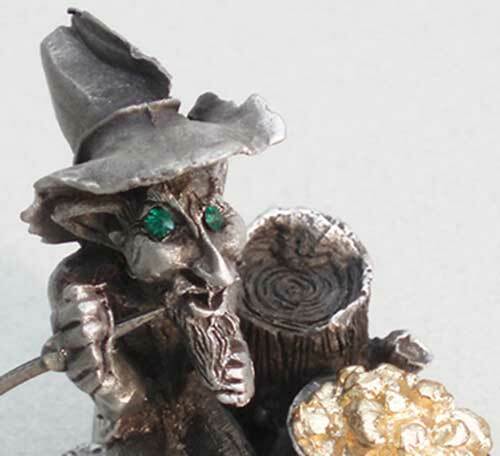 This pewter leprechaun is a retired design that is limited to stock on hand. This leprechaun is a miniature that is cast in fine pewter. The miniature leprechaun is sitting next to a pot of gold along with a stump; he is enhanced with green glass eyes and a pipe. The miniature Irish figurine features great detail and measures 1 1/4" wide x 1 3/4" tall. This pewter Irish leprechaun is made in the United States; it is gift boxed, complements of The Irish Gift House. Miniature Irish figurine is a pewter round tower.